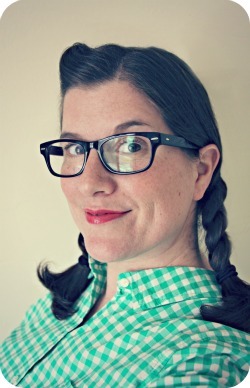 WhiMSy love: Do You Miss Me?? Golly gee. I'm a busy girl. Just thought I'd take a brief sec to say hello to my blog friends! I've been swamped with orders (which is WAY cool! ), working on a couple custom orders & finding it super hard to keep my store stocked with awesome goodies AND make all this stuff for the bazaar. I don't know how people do this on a regular basis. I also HAD to take a break from life & clean my art studio. I can now see the carpet. YAY! I needed to get organized. Things are gonna get crazy in the next couple of weeks. My AWESOME order came last week from Lisa ,of Mariposa Avenue. 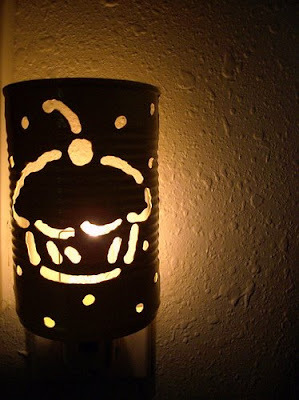 I ordered THIS, & got that adorable cupcake nightlight too! It's in the girls' bathroom. Is that weird to have cupcakes in the bathroom? I'm planning on giving the lantern as a gift--but I'm getting so attached to it, that I might not be able to give it up. Lisa is an AMAZING artist & I'm so impressed with how she makes these creations from cans. They are smooth & shiny & absolutely unique! I also got my order from tiny things are cute. Because they love me so much (haha! ), they sent along loads of extra goodies. My girls will have a rockin' stocking this Christmas! I also got a couple other supply-type items that I'm excited to play around with. Look how it all came packaged! Awesomeness. And as a surprise in the middle of a hectic week I got a package from my granny--a can full of forks! My granny has done the thrift shopping circuit with me looking for forks, so I have her highly trained in exactly what I'm looking for. Wasn't that sweet? Fork easels, here I come! 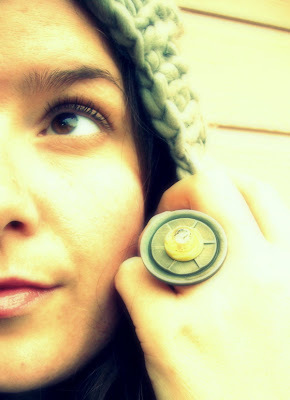 I decided to take some more artsy & interesting photos for my vintage button rings in the shop. This is the first ring I played with. I used effects from Picnik to sass up the photo. I've got a tutorial in the works, so do not be dismayed my tute lovers! I've just got loads to do & scarcely any time to get it done in! So how's this for brand recognition? Every time I hear Jason Mraz or see a cupcake I think of you and how much I want one of those serving size fork easels! Are you gonna get those in the shop before Christmas do ya think? ooo I love good mail days!! hehe i miss you when you're not here, i check you daily so don't ever leave for long!! Yes, we missed you!! I love that cute kitsch packaging!! How creative!! I LOVE that photo! And the cupcake lantern? This is my favorite blog in the entire world!